At Walmart, the customer is always No. 1. And that belief affects the way we do business and how we care for our associates. With both customers and associates in mind, these key leaders shared their thoughts on fresh food, global impact, saving time and opportunity at Shareholders 2016. 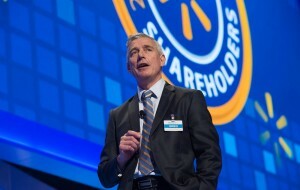 Greg Foran, President and CEO of Walmart U.S., is passionate about delivering top-quality fresh items to customers. “We are proud to be the world’s largest grocer, and we have a strong and mighty team around the world focused on winning in fresh to ensure our customers are saving money so they can live and eat better,” he said. One of the keys to winning in fresh is building direct relationships with suppliers in the U.S. and around the world. “We’ve doubled our sales of local produce in the U.S. over the last six years, and fresh food is a large part of our commitment to buy $250 billion in products that support American jobs,” Greg said. Walmart’s commitment to improving quality of life around the world doesn’t stop with the produce it sells. 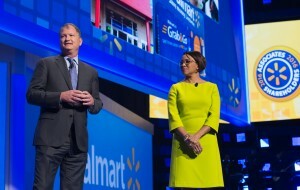 David Cheesewright, President and CEO of Walmart International, and Kathleen McLaughlin, Chief Sustainability Officer, discussed how the company uses sustainability to make a difference. Walmart’s commitment to run the business in a more sustainable way took shape 10 years ago. “We set long-term goals to operate with 100% renewable energy; create a zero waste future; and sell products good for people and the environment,” David said. “And since then, we’ve made incredible progress in our operations,” from doubling the efficiency of our fleet of U.S. trucks to diverting more than 75% of our global waste. While these efforts help save the planet, other initiatives are saving another precious resource: time. “We’re making shopping easier and more convenient for our customers. 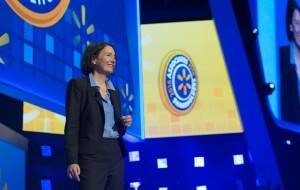 Walmart has always saved people money, now we’re saving them time – time they can spend with their families, or being more productive,” said Neil Ashe, President and CEO of Global eCommerce. Pickup is the fastest growing segment at Sam’s Club. “It’s been growing more than 25% each month,” said Rosalind Brewer, Sam’s Club President and CEO. “We’ve been doing online grocery for a really long time – 18 years in fact,” David added. Pickup is available in markets like the U.K., Argentina, Canada, China, India and Mexico. 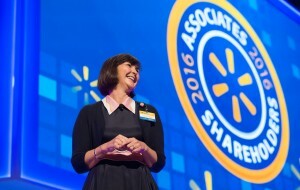 Great shopping experiences are only possible by investing in the business and in our associates. “Walmart is a place where new doors are constantly being opened. It’s a place where you can get a professional start, learn new skills and move up,” Jacqui said. Programs like Pathways in the U.S., Women in Retail in Canada and Step Up in the U.K. are giving associates the training and support they need to make all this happen.